It will change the internet forever! Apple is one of the most innovative tech companies around, with their current patent there is no doubt that they are key at being environmentally friendly as well as technologically advanced. Wouldn’t it be nice to have a laptop that didn’t need to be plugged in to charge? What about taking your portable device with you into un-industrialized places? This has been sought after for many years now and it seems that a good company is in the right place at the right time. I look forward a self sustaining portable device. While we wait, and wait… and wait for manufactures to perfect long-lasting fuel cells, Apple and others are pursuing at least one other approach: solar augmentation. In a patent application dated April 24, 2008 and titled “Solar cells on portable devices” attributed to a number of Apple employees, Apple reveals possible plans to integrate solar cells into devices such as iPods and MacBooks. The application describes a scenario where, “Solar cells are typically stacked with other layers made of transparent or semi-transparent materials… Some of these layers may be used for display or input purposes, and some layers may be coated with various materials or they may be etched with product logos or other patterns.” In other words, Apple is looking to cover the entire device, including the transparent display, with a layer of solar cells — the latter approach already patented by Motorola. While the efficiency of solar cells and existing manufacturing techniques call into question the immediate viability of such an approach, it’s intriguing nonetheless as a means to offset any lost battery life on the move to say, 3G. 05.25.08 — A NASA spacecraft today sent pictures showing itself in good condition after making the first successful landing in a polar region of Mars. 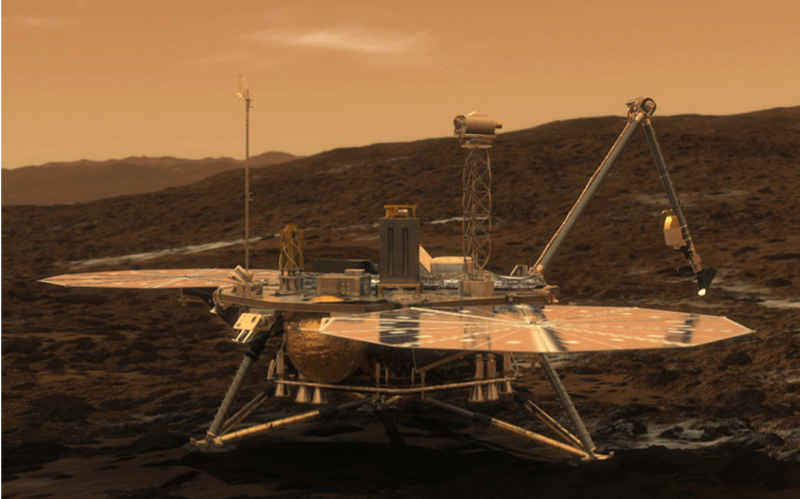 Radio signals received at 4:53:44 p.m. Pacific Time (7:53:44 p.m. Eastern Time) confirmed that the Phoenix Mars Lander had survived its difficult final descent and touchdown 15 minutes earlier. In the intervening time, those signals crossed the distance from Mars to Earth at the speed of light. The confirmation ignited cheers by mission team members at NASA’s Jet Propulsion Laboratory, Pasadena, Calif.; Lockheed Martin Space Systems, Denver; and the University of Arizona. Phoenix carries science instruments to assess whether ice just below the surface ever thaws and whether some chemical ingredients of life are preserved in the icy soil. These are key questions in evaluating whether the environment has ever been favorable for microbial life. Phoenix will also study other aspects of the soil and atmosphere with instrument capabilities never before used on Mars. Canada supplied the lander’s weather station.